Don't miss the very special offer at the bottom - no not from me, from a retailer. It ends on the 9th. I have ordered the heart puzzle example at the bottom (and a few others...) and can't wait to see how they turn out! Quick thought for today...it's all about balance again. We humans tend to swing to extremes when God teaches us the truth is in balance, "rightly dividing the word of truth". The topic is works. One extreme feels they have to "work" their way to heaven by dotting all the "i"s and crossing all the "t"s. The Bible says we are saved "by grace through faith and not by works" we ourselves can do so that no man can boast. Ephesians 2:8 So others swing to the extreme of "all works are evil". The balanced truth of God is that He says if we love Him, we will obey Him - works. John 14:15 Not as a compulsory list of commands we must do to get to heaven, but out of an intimate love relationship with Him, we WANT with all our hearts to be and do all He wants for us and to never again shame or hurt Him. Love compels us, not "working our way to heaven". He commands us to do good works, telling us we are created for good works. Works are an indispensable part of our lives as Christ followers, just so we don't confuse it as our works making us worthy of heaven. Only the grace of God and the shed blood of Jesus on our behalf will get us to heaven. Let's not neglect to live a life of good works! This is such an exciting gift! 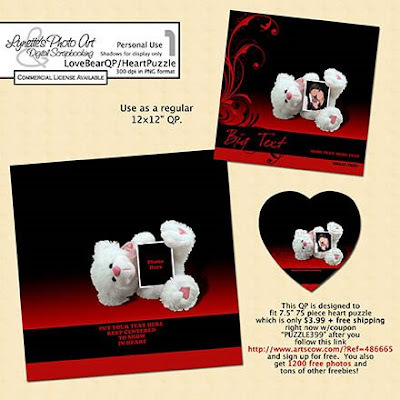 I just love how the Love Bears turned out and then I got a coupon from HERE for 7.5" 75 piece heart puzzles for only $3.99 and free shipping...so I set about to make a QP for you that would print just right for a heart puzzle there (they crop this QP to the heart shape when you upload it). If you follow this link and sign up (free-no obligation) you will also get 1200 free pictures and a ridiculous ton of other freebies too including FREE BOOKS! To get this offer on the puzzles (rectangles available also) you must sign up, which is free, and enter "PUZZLE399" in the shopping cart. HURRY the puzzle offer expires on the 9th!!! I've been very happy with the quality of the pictures I have gotten through them. I also shrink my 12" LOs to 8" squares and print as 8x10's with their free 8x10s. I wish I could make their books as they are so cheap, but I'm on a Mac and their software won't work for me and their customer service is silent. If any of you knows how to work around this PLEASE TELL ME! Just thought you might like a cute heart puzzle and lots of free pictures. On the QP preview I used Doodlie25 by CajunDesignz. It is not on the QP as I don't have permission. If you download, leave me some love at the bottom of the post and God bless your use of it! After receiving my puzzles, I do not recommend this vendor for puzzles. They were extremely thin, cheap looking and all the whites were printed as a filthy grey. Very disappointing. Their coasters and mouse pad were all washed out, no contrast. However, I am satisfied with their photo development, but it takes weeks to receive them and I do not plan to use them any more. Thank you! Your blog post will be advertised on the DigiFree Digital Scrapbooking Freebie search engine today (look for timestamp: 07 Feb [LA 07:00pm, NY 10:00pm] - 08 Feb [UK 03:00am, OZ 02:00pm] ).